I am not a Beatles fan, but feel I should be after seeing this show. Let It Be not only perfectly recreates the sound of the Fab Four, the guys who play the parts are fabulous musicians and actors, brilliantly capturing their sound, mannerisms, movements and cheekiness. 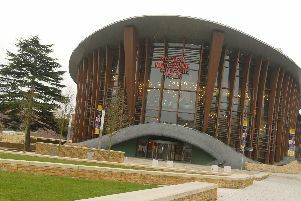 The atmosphere created at The Waterside Theatre in Aylesbury last night (Tuesday) was akin to a live concert, with the audience up on their feet, singing, dancing, waving their arms and their mobile phones. And in spite of not being an actual fan of The Beatles they are such a huge part of our cultural heritage I found I knew the words to just about every song and heartily sang along, as did most other people there, to everything from A Hard Day’s Night, She Loves You, Yesterday, Help, Eleanor Rigby, Lucy in the Sky With Diamonds, Magical Mystery Tour, All You Need Is Love, Penny Lane …. the list goes on and on. The show is a celebration of the music of The Beatles and covers their entire career, taking the form of a concert where their look and sound evolves as their music progresses. Reuven Gershon, who plays Lennon, delivered the line in the same cheeky style and then told the audience to get on their feet to Twist and Shout. He didn’t need to ask twice. The show is a full on concert and so the tour has two cast members for each Beatle, so it isn’t always the same guy at each performance, and they will change over the course of their week at the Waterside. But when I was there last night (Tuesday) in addition to Gershon as Lennon, there was Ian B Garcia as Paul McCartney, Josh Brosnan as George Harrison and Luke Roberts as Ringo Starr. Gershon in particular is mesmerising and it was impossible to take my eyes off him, it was like seeing John Lennon reincarnated. Although slightly stockier than the extremely slim Lennon, from where I was sitting Gershon’s face was eerily similar to Lennon, and he captured perfectly the cheeky grins and the cheekier language. Indeed, the friend I brought with me said she felt she was watching Lennon. This is not to diminish the others, who were equally as talented musically and dramatically. Garcia had McCartney’s head bobs off to a tee, and managed to get the Liverpudlian accent into the songs as well as into his spoken word. Roberts as Ringo Starr played a blinder on the drums and got his spot in the vocal sun with a rendition of Yellow Submarine. Harrison, the quiet man, always proved that silence can indeed be golden and so did Brosnan who was anything but quiet on the electric guitar and took over the lead on some of the songs including Roll Over Beethoven and Here Comes The Sun. There was a real camaraderie with the guys, reminiscent of the casual and chirpy banter between the real Beatles. After Garcia sang McCartney’s Blackbird, Brosnan/Harrison teased him that he’d be growing wings next, and when Roberts/Ringo came on stage there were jokes about the Fat Controller. The show was aided by newsreel footage throughout, which not only charted the story of The Beatles but also the history of the times, moving swiftly from dated and ludicrous advertisements for cigarettes and shampoo, to film of cultural Sixties icons Twiggy and Mary Quant and into the seriousness of the Vietnam war. Nowhere was this footage more appropriate than during the segment devoted to The Beatles’ conquering of America and their appearance at The Shea Stadium where they played to over 55,600 screaming fans. The footage and screaming added hugely to the atmosphere in the theatre. The lighting effects, particularly during the psychedelic era were brilliant and especially during Lucy in the Sky with Diamonds. And it was nice to see a touching tribute to Beatles producer George Martin who died earlier this year age 90. At the end the audience simply wasn’t prepared to let the guys go, shouting ‘more’ and ‘encore’ and stamping our feet until we were rewarded with Let It Be, Get Back and Revolution. Even that wasn’t enough and after the band had left the stage, following demands for another return they duly came back and played a final track, the ionic Hey Jude, with plenty of enthusiast audience participation at the ‘na na na na a na na’ part. This is a real feelgood night out not only for genuine Beatles fans, but for anyone who likes a live gig with extremely talented musicians and familiar music. Let It Be is on at The Waterside at 7.30p each evening until Saturday May 7, with additional matinees at 2.30pm on Thursday and Saturday.